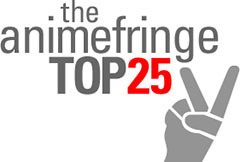 What is The Animefringe Top 25? Well, in a nutshell, it is our annual ultimate "people's choice" poll to determine the top 25 anime-related sites on the web! Anyone can vote, and anyone's anime-related website can be entered! Casting your vote is easy - just fill out the tiny form on the bottom with your three favorite anime-related websites and press the "Vote!" button. Please be sure to enter the website's URL, including "http://" before the address -- not the website's name. For sites that make the top 25, we'll visit them and take note of the names and webmasters. Example: "http://www.animefringe.com/" is acceptable. "Animefringe" isn't. Lastly, do not submit more than one vote. IPs are logged, and any duplicate votes cast by the same person will be disqualified and disregarded. With that in mind, please feel free to let your voice be heard by casting your vote! THE POLLS HAVE CLOSED! Check back for the results on January 1, 2004!